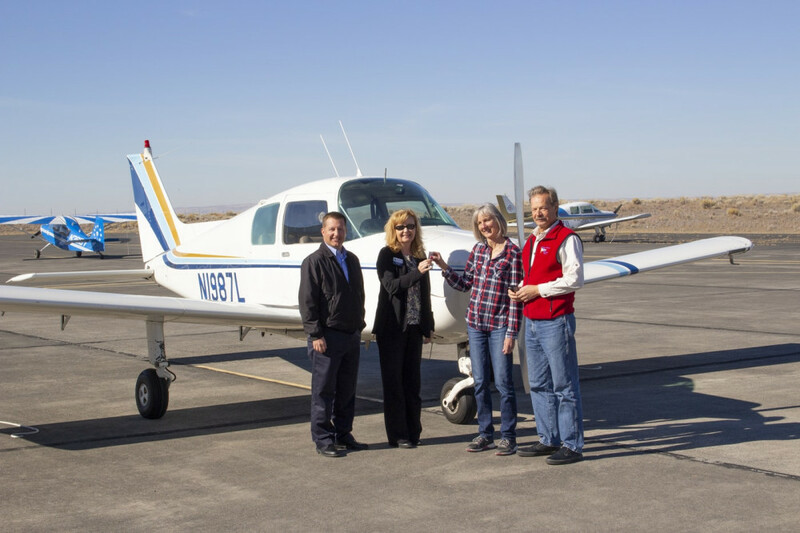 The Big Bend Community College Aviation Program received an early Christmas present this year in the form of a Beechcraft Sport B-19 aircraft, and Santa Claus came in the form of Kevin and Ann Peterson of Seattle who delivered the plane to the Grant County Airport in October. The Peterson’s connection to the BBCC Aviation Program began about 20 years ago when they first purchased the airplane. As they searched for an aviation maintenance technician (AMT) that could perform regular maintenance on the Beechcraft, Big Bend and former BBCC AMT David Link’s name kept coming into the conversation. “I flew over to talk to Dave and his mild manner and the excellent grasp of the airplane informed me that Dave would be able to teach me how best to maintain the aircraft. I would fly the airplane to the Municipal Airport where Dave used his brother’s hangar for the annual. Dave would make me prep the airplane (take off inspection plates, remove panels, etc.) so he could quickly do his magic,” said Kevin. “This was often done with Dave sitting in a lawn chair. Kevin said 1987L (the plane’s tail number) was built in 1976 and purchased by him and his wife in 1999. For the last 20 years, he described the airplane as his second car as they lived on San Juan Island and frequently commuted to Seattle, Portland, and other regional destinations. As he and wife transitioned into retirement, the airplane’s use reduced. However, before they donated it to Big Bend, their daughter Mari used the 1987L as her trainer. Now, it has found a new home with the BBCC program. “We felt 1987L needed a home where she would be well cared for and returned to her role of training pilots. We considered selling her but realized a private buyer might not provide the care and respect we gave the airplane and it might be abused,” Kevin shared. “Dave (Link) shared the passion Big Bend had for the airplane and how challenging it was to keep the fleet viable now that the airplane is no longer produced. Swedburg said that is exactly what will happen. “This aircraft will be put to use as soon as our mechanics can complete a thorough inspection and make sure that it meets the standards of our current fleet,” Swedburg said. “Hopefully it will see flights with the students in just a few short weeks. In photo: (From left to right) Big Bend Chief Flight Instructor John Marc Swedburg and BBCC Foundation Executive Director LeAnne Parton accept the keys to the Beechcraft Sport B-19 from Ann and Kevin Peterson.